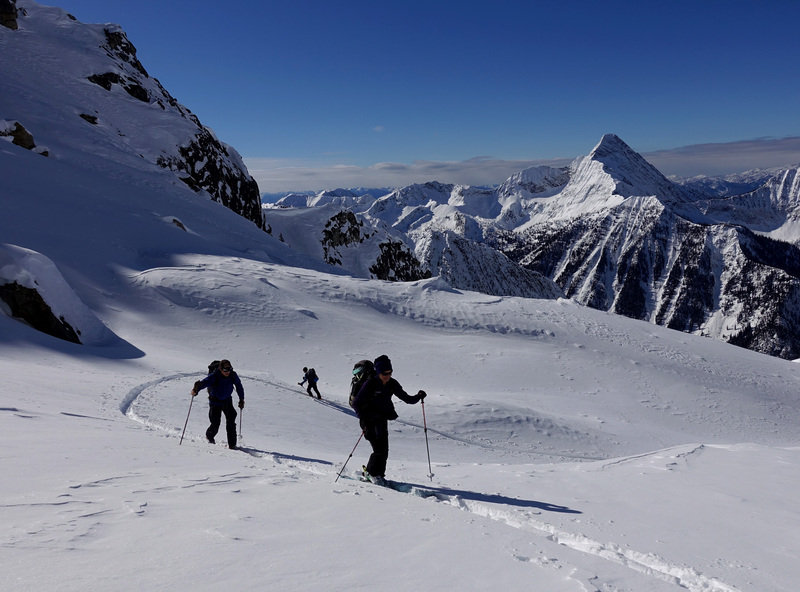 We just finished a 4-day backcountry ski touring basecamp at Bernard Lake in the Southern Purcell Mountains March 4-7, 2019. This area is located near the headwaters of Bernard Creek about 16 km East-Southeast of Kaslo BC and 6km Southwest of Powder Creek Lodge. We accessed our basecamp by helicopter from Kaslo. We camped at the creek outflow near the North end of the lake where good drinking water could easily be collected. The weather was initially cold and clear with daytime highs in the -15C range. The last few days were warmer and cloudy with variable moderate winds. On our last day, the area received about 10cm of low-density snow with light winds from the West. The terrain in this area is generally complex with a few less committing challenging options. The Moderate Avalanche Hazard in this area gave us confidence to explore some of the more complex terrain. 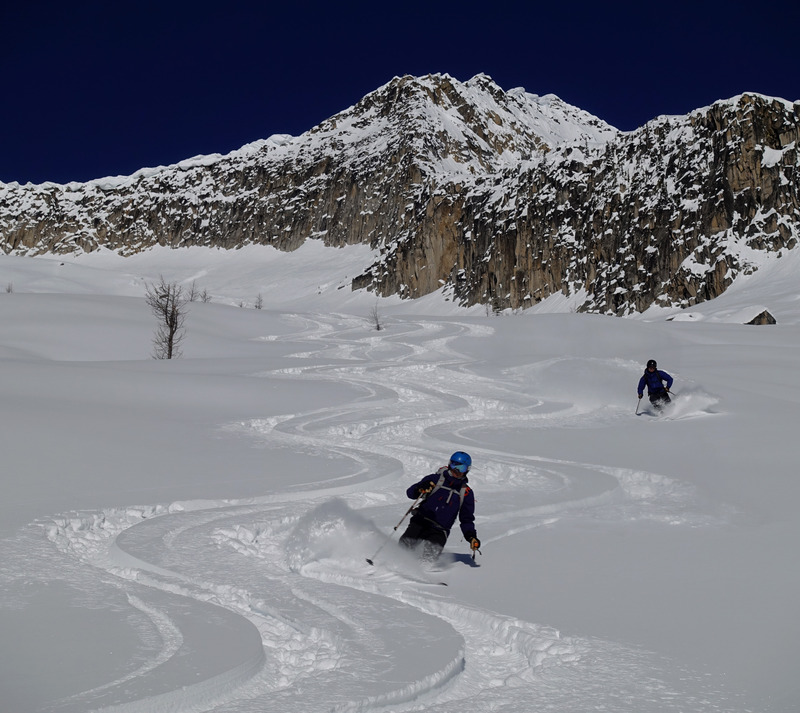 We skied a mixture of alpine and treeline terrain on all aspects between 2600m and 1800m in the headwaters of Bernard and St-Mary Creeks. 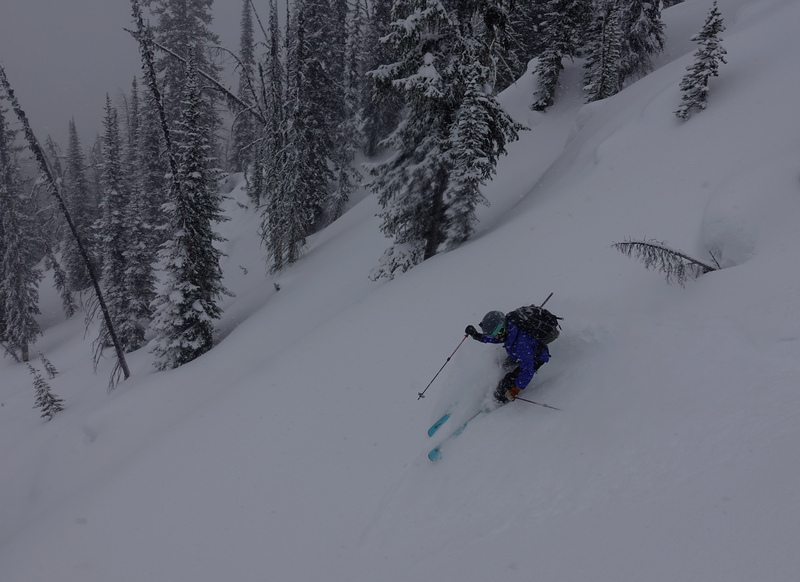 In the Alpine, we skied supported terrain with deeper snowpack characteristics and avoided shallow areas. We also minimized our exposure to any overhead hazard particularly on solar aspects with regards to daytime warming and increased solar radiations. Of note, cornices have gained some mass recently, we definitely minimized our exposure to this growing concern. At treeline and below treeline, we skied steeper unsupported terrain and noticed only minor sloughing. Surfaces varied from mid-calf powder on protected slopes, variable wind pack snow in exposed areas and sun crust on steep solar aspects. As reported in other nearby areas, the snowpack here is thinner than usual. The height of snow at treeline was in the 180cm range. The snowpack is also very faceted and weak due to generally colder temperatures since mid January. We observed significant depth variability from thin snowpack in exposed areas to deeper snowpack in protected areas above treeline. Increased faceting was significant in exposed areas. This snowpack will provide a very weak base with more loading for the rest of the season. Despite the thinner sugary snowpack, we found great skiing everyday. Test profiles on East and West aspects in the alpine showed Easy to moderate shears down 20-25cm in recent storm snow, moderate to hard sudden shears down 30 to 40cm in previous interface and hard to very hard sudden shears in older persistent slabs down 60-80cm. Avalanche wise, we did not see any new slab avalanches during our stay. We noticed a few loose snow avalanche (size 1-1.5) on steep solar aspects. We also notice evidence of a previous avalanche cycle (possibly a week+ old) in the alpine with wind slab releases out of steep start zones below ridge top to size 2 and one larger persistent slab releases (size 3) out of steep rocky and unsupported south facing terrain at 2500m. We did not see any signs of instability other than very minor cracking in wind affected snow and a few smaller whumpfs. All in all, a really good area for a basecamp with the right group and reasonable avalanche conditions.